Taste test: The "dirty" chips look darker, but they are not burned, it's only because they have been cooked in peanut oil. There's also a lot of salt and vinegar on these chips, and they have a good crunch. An above average chip, but not the best we've tasted. 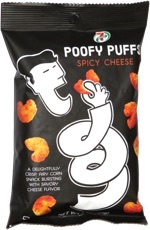 Smell test: A very strong, nasal-stinger, vinegar smell awaits you when you open the bag. 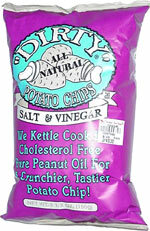 Trivia: John Shaw (no relation to Keith) is the Chip Master at Dirty Chips. This snack was discovered by Keith and Melissa at Christmas Tree Shops. Review published .